As the weather turns chillier I find that I want comfort foods. That generally means one dish cooking. This crook pot meal is almost one dish. You do need to brown the beef before putting it on to simmer. It first attracted me because of it's unusual ingredients, now I keep coming back to it because my family likes it. 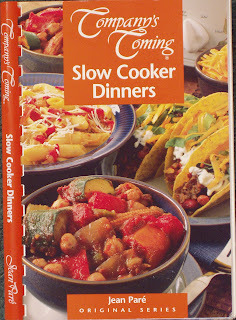 Combine first 10 ingredients in 3 1/2 to 4 quart slow cooker. Heat the cooking oil in large frying pan on medium. Add ground beef. Scrabmle-fry for 5 to 10 minutes until no longer pink. Drain. Sprinkle flour over beef. Heat and stir on medium for 1 minute. Slowly add broth , stirring constantly and scraping any brown bits from bottom of pan. Add to tomato mixture. Stir well. Cover. Cook on low for 8 to 10 hours or on high for 4 to 5 hours. Remove and discard bay leaf. Add parsley. Stir well. Serves 6. Eat as is or serve over rice. 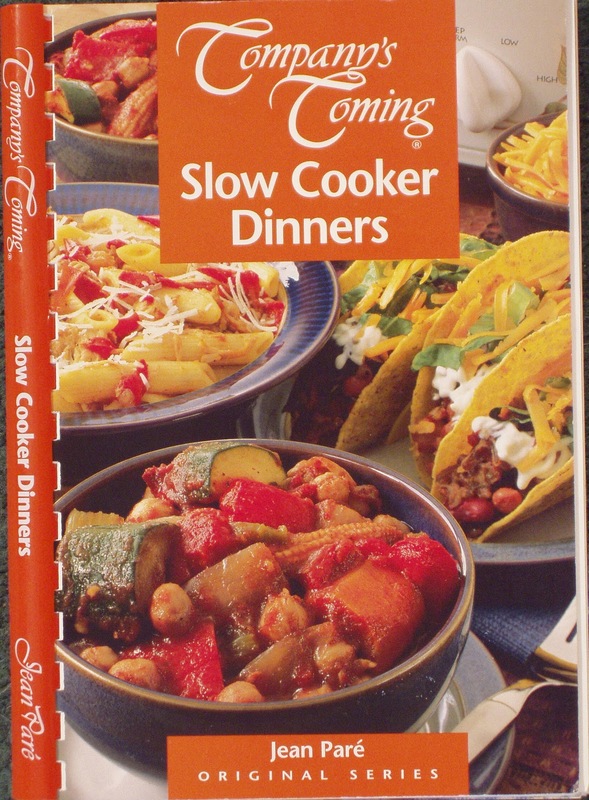 This recipe is from Company's Coming: Slow Cooker Dinners. 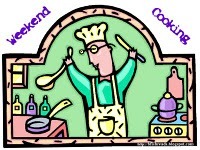 "Weekend Cooking" is hosted by Beth Fish Reads. You are invited to join in the fun by visiting and reading the various food related posts. You can also enter a link to your recent food related post. Be sure to visit this week and learn about Beth's Halloween post about the giant fruit bats. Looks like it would be a good dish! I love crock pot meals on any night of the week! What are those smiley things on the plate?? Are they crackers? Thanks again for nominating me for the versatil blogger award. I've been getting lots of new visitors since my post. One pot cooking is known as 'one stop cooking' by my children, I can never decide whether there is irony or sarcasm involved! And I love it, who wants a sink full of pans! Also, with the range on really low for several hours cooking it warms up the kitchen beautifully for when they all get in from work and school. Thank you for the recipe- and for visiting me at my place! Most of my meals tend to be one-pot cooking these days. Anything from Chilli-Con-Carne, Bolognese, Cottage Pie, to Farfalla. They are generally good and wholesome meals, when cooked this way and served with pasta or rice. Also makes for a lot less washing up afterwards!! That looks delicious and sounds easy! I was wondering about the smiley faces too - they're adorable. This is my kind of cool-weather meal. Sounds good an easy. 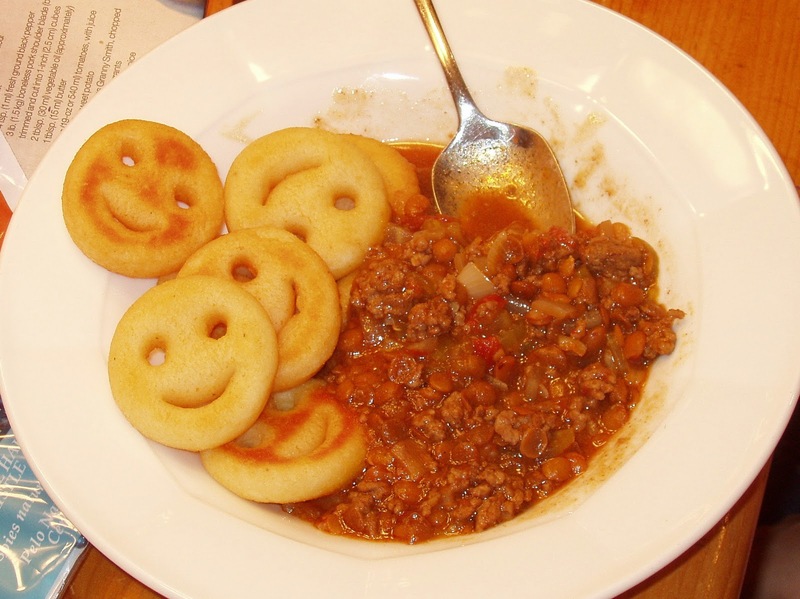 The smilies are a potato patty. I think they might be from McCain. Oh this sounds delicious. I don't have a crock pot but I'm sure it will work on the stove top. I made lentil soup every winter so I think my family will really like this stew.